I generally like to sidestep new restaurant openings until they have settled down and got into their stride. 22.06.2014 - But there is no reason to do so here at La Toscana in Los Realejos where Alexander is in charge of the kitchen, and his wife Goretti looks after front of house. Alexander has gained much experience in other restaurant kitchens, and this is his first solo venture. 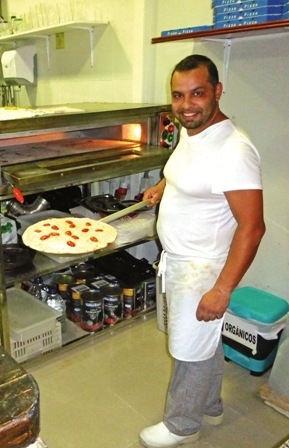 It is a small restaurant with half a dozen tables all overlooked by the open plan kitchen, where Alexander and his team are on display as they make their fresh pizzas from scratch, including the bases. But this is not just a pizza parlour. No, there is a range of pasta dishes, from the ubiquitous lasagne to specialities such as saquitos – little pasta parcels of pear and apple presented in a cream sauce with nuts. So different…so more-ish! We were welcomed very warmly and given the menu – only in Spanish at present – choosing to sit facing the kitchen to watch the activity. For such a small place, there was a lot going on. Alexander has an assistant, and a third young man also does duty as the pizza delivery scooter rider. He was kept busy, helmet no sooner off than back on, because the telephone rang regularly for take-aways. This is not a fancy place, and nobody pretends to airs and graces. A little out of the way, and unprepossessing, one goes there for exceedingly well cooked pasta or pizza, served in portions that vary between the generous and the frankly huge. We tottered out with two boxes of our left-overs, pressed upon us, sufficient for meals on the morrow. A bottle of Italian wine, a Casteltorre DGP, the grape Sangiovese, the district Puglia in the south of the country was a perfect foil to our meal. One could almost taste the sun and the dust of the south! Our starters were the home-made croquetas, fish and meat alternatives (€4.50) and an immense platter of toast rubbed with garlic and topped with slices of fresh tomato, warmed mozzarella and Serrano ham. It all just melted in the mouth and was entirely delicious, drizzled with olive oil, a great deal at €4.50 for two. Had we saved enough room for the main course? We both doubted it. A giant 14 inch pizza was placed before my wife. Had she been standing, I am sure that her knees would have buckled at the sheer size of it. She gave it full marks, but half of it had to go into a carton to go home afterwards. My spaghetti carbonara, which is so difficult to get just right (which is why I chose it) came with feather-light pasta, smoky bacon (more next time, please!) and so smooth with the egg that it slid through the mouth, just as it should. Those saquitos are priced at €8.50 and I can testify that the creamy sauce that they come with is truly scrumptious – I got a small taster plate to try. I had my eye on the brie parcels with tomato chutney at €7.50. Focaccia comes in different guises with out of the ordinary toppings, and there is a nice selection of chicken and steaks, should the choice of salads and calzones not be to your liking. All in all, a good menu, showing off the versatility of the chef and the determination to make a success of this new venture. I went and had a poke round the kitchen at the invitation of our chef, and could see that he was kept steadily busy with a flow of orders. We promised to go there again soon. So should you! Open: 12 noon to 4pm and 7pm to 11pm, but closed all Monday, and Tuesday lunchtime. Misc: Wheelchair Access, Free WiFi, and one hr free parking in the Municipal Car Park, almost next door, if you get your parking ticket stamped by Goretti.